Copyright (c) 2014, Eduardo Rodriguez Tunni. Copyright (c) 2000, Modular Infotech, Pune, INDIA. All rights reserved. Copyright (c) 2011 by Brian J. Bonislawsky DBA Astigmatic (AOETI) (astigma@astigmatic.com). All rights reserved. Amita is the Indian Feminine form of Amit. 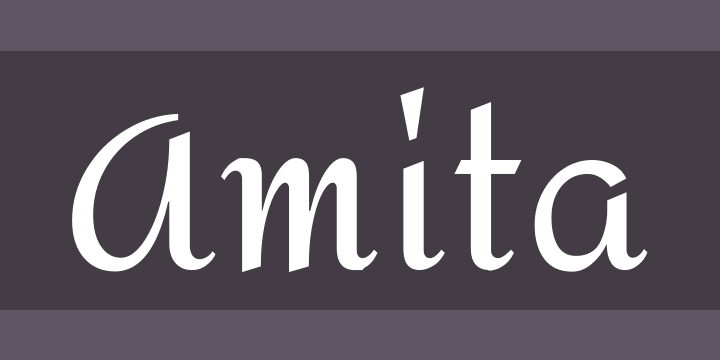 Amita is a Latin and Devanagari typeface derived from Redressed and Modular Infotech Devanagari 2310 and 1228. The Latin is a script type designed by Brian Bonislawsky which blends script and italic letterforms together in an upright non-connecting style. Open spacing and stylish letterforms lend themselves to titling, but also to clean legibility at smaller sizes as body copy. The Devanagari is a traditionally calligraphic style. The combination was designed by Eduardo Tunni.